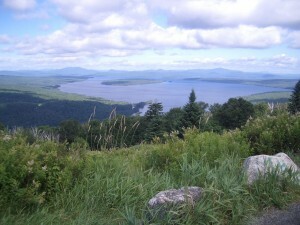 We decided to have our wedding in Rangeley, Maine, near Mooselookmeguntic Lake, because the area is beautiful. Additionally, Aaron’s family has a long history in the area. Aaron’s maternal grandparents spent their honeymoon at Bald Mountain Camps on the shore of Mooselookmeguntic Lake. They had such a wonderful time that they returned often before purchasing a log camp just a short distance from Bald Mountain Camps. Aaron’s mother and her brothers spent nearly every summer of their youth on the lake. Aaron grew up about an hour from Rangeley and, like his mother, spent many happy summer days on Mooselookmeguntic. Alison and Aaron have made several trips to Rangeley and celebrated their one year anniversary at Height-of-Land. Rangeley – Small town at the center of the Rangeley Lakes region. Population 1,168. The wedding ceremony and reception will take place at the Mingo Springs Golf Course in Rangeley. There are several restaurants, an ice cream shop, gift shop, and movie theater on Main Street in Rangeley. Oquossoc – Even smaller town with a small commercial center along Carry Road. West of the commercial center on the shore of Mooselookmeguntic Lake is Bald Mountain Camps where dinner will take place on Friday night for guests from out-of-town. Sunday brunch will be nearby at Aaron’s grandma’s house. Mooselookmeguntic Lake – A 25-square mile lake home to loons, fish, ducks, eagles, and moose. Height-of-Land – A scenic turnout about 8 miles from Oquossoc where you can take in the view shown above for yourself.